Melodic hard rock has had its time. There’s no denying that it still lives and, to some degree, thrives but its glory days are long, long gone. Its current state isn’t helped by fast-buck-making labels and a certain sort of purist fan that simply won’t allow any of these artists to move away from a hackneyed, formulaic sound. So, new releases from bands that have been plying their trade for thirty years more often fill me with a sense of sorrow than a sense of joy. 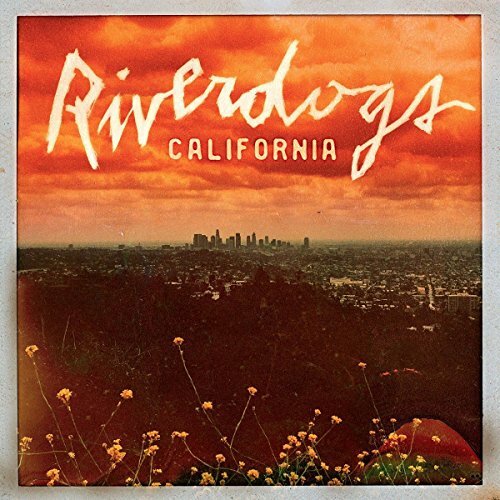 Not so with the latest Riverdogs album, California. This is a record that might just be too good for the classic rock fraternity to properly deserve. Even in 1990 the Riverdogs didn’t fit alongside the big-haired bands they were inevitably associated with, their earthy and soulful sound owing more to southern American blues than to the rise of heavy metal. However, the rock pedigree of guitarist Vivian Campbell - along with the length of the band’s hair - somehow sealed their fate. And so, here they are on the Frontiers label with California, their first album since 2011’s World Gone Mad and only their third studio release since their twenty-seven year-old debut. Existing fans be warned, California is heavy, man. The guitars are very upfront and Mr Campbell gets to let rip in accordance with his rock royalty status (and why not? - Campbell’s frustration at always having to play second fiddle to Def Leppard’s Phil Collen is well-documented) but for me, vocalist Rob Lamothe holds the key to the album’s charm. His string of consistently rewarding acoustic-driven solo releases show an introspective, gentle and poetic side (three words that aren’t often uttered in the world of hard rock) and he’s managed to transfer much of that nuance onto this, an altogether different sort of record. As a result, this is a rock album with more light and shade than most, helped not only by Lamothe’s songwriting skill but also by his ability to move comfortably between hushed intimacy and throaty howl. Opener ‘American Dream’ is a pounding, brainless rocker - I’m tempted to just ignore it as a misstep because the next four tracks are by contrast a total delight. From the bristling, energetic rock of ‘The Revolution Starts Tonight’ and the slow swaggering blues of ‘Something Inside’ to the feelgood ‘Golden Glow’ and the self-aware ‘You’re Too Rock n Roll’, these are just perfectly crafted, timeless rock songs. The Zeppelin-flavoured ‘The Heart Is A Mindless Bird’ promises much but descends into an all-out shred-fest which is something of a disappointment, as is the blunt metal riffage of ‘Searching For A Signal’ - perhaps that opening track wasn’t a misstep after all - but things get back on track with the more political ‘Welcome To The New Disaster’ (think Tesla at their best) and the gloriously singalong ‘Ten Thousand Reasons’ which features another extended solo - thankfully this time less gratuitous. The stripped back verses of album closer ‘I Don’t Know Anything’ are perfectly balanced by Campbell’s wailsome guitar refrain which serves as a chorus in between. As a result, this is one of the most effective songs California has to offer and something of a personal favourite. If you like your melodic rock to have a bit more to it than nostalgia and stylistic box-ticking then California will no doubt meet with your approval. If you like Americana with serious cojones you’ll be equally pleased. It’s by no means faultless but California is by far the classiest hard rock album I’ve heard all year. I’ve had an extended break from reviewing hard rock, although as a genre it remains my first love. There is a cynicism that comes with age and I simply struggle to get excited about most new releases. I find myself shaking my head (like the old man I am) and coming to the predictable but inevitable conclusion that they just don’t make rock records like they used to. I suspect that a similar sentiment was the starting point for Animal Drive’s new covers EP Back to the Roots. The Cats In Space story is one of perseverance, refusing to give up in the face of adversity and sticking with what you know. The members of Cats In Space have been around, they’ve done the hard yards, put in the miles and it’s refreshing to see the acclaim that has been heaped on the band since they released their debut album ‘Too Many Gods’ in 2015. For their third studio album, the guys are refusing to rest on their laurels and seem intent on pushing the envelope. The result is ‘Daytrip To Narnia’ a record that should please longstanding Cats fans but might also leave a few scratching their heads. Dave ‘Bucket’ Colwell might be a new name to some but the guitarist has played with plenty of notable names in a career that dates back to the 80’s. Colwell’s credits include being one of three guitarists in ASAP with Adrian Smith of Iron Maiden fame, key involvement as a songwriter/guitarist in the reformed Humble Pie on the 2002 ‘Back On Track’ album plus stints in many other acts including Samson, Urchin and The Entire Population Of Hackney. Laurie Mansworth had already seen action with NWOBHM act More when in 1982 he decided on a more transatlantic musical approach for his next musical venture. The result was Airrace and a deal was quickly inked with Atco/Atlantic records for their debut album ‘Shaft Of Light’ produced by Beau Hill (Ratt, Streets, Kix). The 1984 release of the album was well received by press and fans alike, although the majority of the reviews did focus on teenage drummer Jason Bonham (Foreigner, Black Country Communion) for obvious reasons. This did the band a disservice as ‘Shaft Of Light’ had some fine tunes, a terrific singer in Keith Murrell (Mama’s Boys, Cliff Richard), Toby Sadler’s (GTS, Samson) tasteful keys and Mansworth’s punchy guitar contributions. The band toured with heavyweight acts such as Queen, Meat Loaf and AC/DC but by 1985 Airrace was over and the band members went their separate ways. In 2011 Mansworth, Murrell and bassist Jim Reid reformed as Airrace and signed a deal with Frontiers which resulted in ‘Back To The Start’ and a busy touring schedule before things again went a little quiet. Fast forward to 2018 and Airrace are back again with ‘Untold Stories’ as classy a piece of 70’s influenced AOR as you’ll hear this year. It’s not easy being a heritage act like FM. Your fans want a nostalgia hit but they also want new releases. You’re trapped. You may want to move on, but you don’t dare go too far. Despite lacking the international successes of Def Leppard or - to a lesser degree - Thunder, FM remain one of the UK’s best-loved melodic hard rock bands and their new record is an impressive balancing act between that rock and that hard place. They might just be the one band on the scene that can manage to please nearly all of the people… nearly all of the time. Every melodic rock fan with half a brain knows that there is no such thing as the perfect AOR album. From the late ‘70s through to the early ‘90s we were awash with perfect moments but, for the past two and a half decades, bands have matched the gems of that period with only very limited success. These days, making records is cheaper and faster; sonically sub-standard AOR albums arrive at an alarming rate and are all accompanied by unhelpful amounts of hype, so it’s no wonder that fans have become cynical about new releases. How refreshing it is, then, to come across an artist whose press makes no claim whatsoever and who has made an album that doesn’t sound as if it was cobbled together in a hurry. One-man freaky genius (he plays, sings, produces and mixes everything) Tom Satin quietly released his debut in 2014 and now the follow-up, It’s About Time, has arrived seemingly out of thin air. While it’s not perfect, I’d say it’s about as close as anyone has got in a very long time. Tokyo Motor Fist is a melodic hard rock project fronted by the dream-team of vocalist Ted Poley and guitarist Steve Brown. Bass and drums come in the form of veterans Greg Smith (Rainbow) and Chuck Burgi (Red Dawn) respectively. I would normally be very wary of this sort of career vehicle but the blistering riff and infectious singalong chorus of the opening track are enough to make me think that this time, maybe - just maybe - I might be on to a bit of a winner. Unruly Child released their debut in 1992 and, although not a commercial success at the time, it has since been held up as a melodic rock masterpiece. An inspired coupling of ex-World Trade members and vocalist Mark Free (formerly of AOR legends Signal), Unruly Child retained the loosely-held prog leanings of the former band but added the hit-worthy rock bombast of the latter. Free’s muscular vocal delivery in particular helped the band have greater appeal across the rock sub-genres and the debut has subsequently aged far better than many of its contemporaries. The album wasn’t without its faults but it remains one of the more interesting and inventive records under the hair-rock umbrella: it had big guitars, hooks, lashings of keyboards and stacked vocals but - more important than all that - it was chock full of unusual ideas and musical ambition. None of this sounded geeky, meandering or noodly, it just sounded, - to me at least - like top class hard rock… from the future. Indiscreet was originally released in 1986 and is one of the finest AOR albums you’ll find from a British band of the period. Unsurprisingly then, it has come to be something of a sacred classic among fans of the genre, making it extremely risky business for FM to decide to release a full re-recorded version to celebrate its thirtieth birthday. Sixteen years since their last studio album is an awfully long time but for Kansas, who can chart their history back to 1970 and released their debut album in 1974, it just feels like a small part of the overall plan. With a quite staggering 30,000,000+ album sales worldwide Kansas are one of the biggest acts of the classic rock era but for all such acts, Journey instantly spring to mind, longevity is a double edged sword as the sands of time can catch up with a band, members leave for a variety of reasons and the musical landscape is forever changing. Kansas have kept themselves busy as they still play around a hundred shows a year and recent releases have included a feature length documentary ‘Miracles Out Of Nowhere’ that charts their long career. Founder members Richard Williams (guitar) and drummer Phil Ehart don’t look to be retiring anytime soon and on the strength of ‘The Prelude Implicit’ it looks like the band are about to embark on an impressive new chapter in their illustrious career. I consider myself reasonably well-versed in the biggest of the big-hair hard rock acts but Treat are a band that have simply passed me by, in spite of their thirty-year pedigree as well-respected Swedish melodic rockers. A career that has seen them constantly in the shadow of the success of Europe might go some way to explaining how it happened, but Ghost of Graceland makes me think I may have seriously missed out.